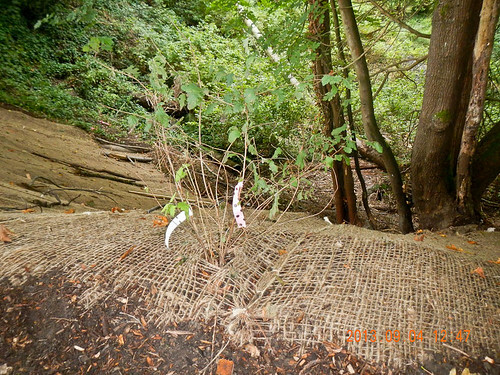 This spring, the Parks Department gave North Beach Park 1/4 acre of invasive plant clearance on steep slopes, an area volunteers are not allowed to work. I’ve always assumed it was a liability issue, which I think now is only partly the case. I now see it as a skill set issue as well. I forgot about it until I was asked to review the contract a couple weeks ago. In the meantime, I had allowed a group of volunteers… um… to work on some steep slopes in the very area the crew was being contracted to work. Which caused some confusion we’re still resolving. In the last week, the crew has come in and done some erosion control and some new invasion removal. 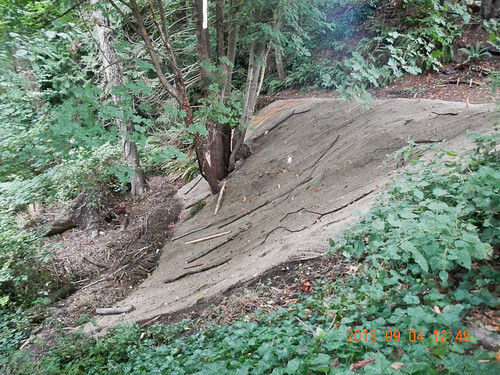 Here’s a side view of some of the erosion control on the Headwaters Bowl slope. 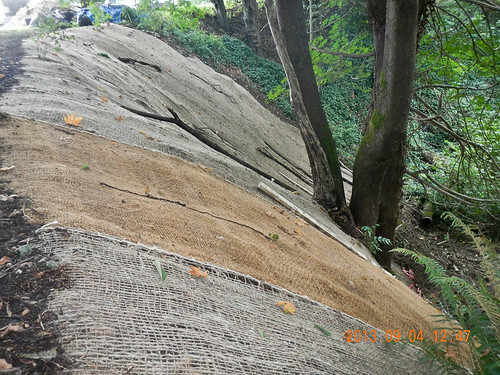 The jute netting is rolled down the hill. Successive stretches of netting are stitched together. 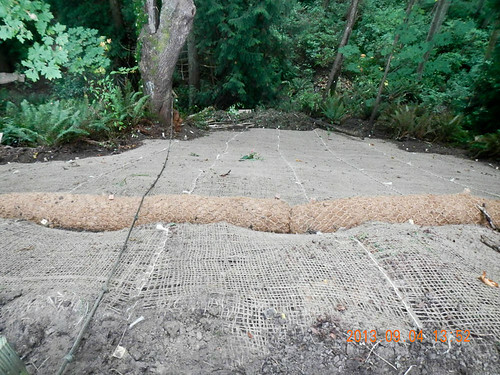 At the top of the slope, a narrow trench is dug, and the netting staked into it with 2×2 stakes. This is covered up when the trench is reburied. 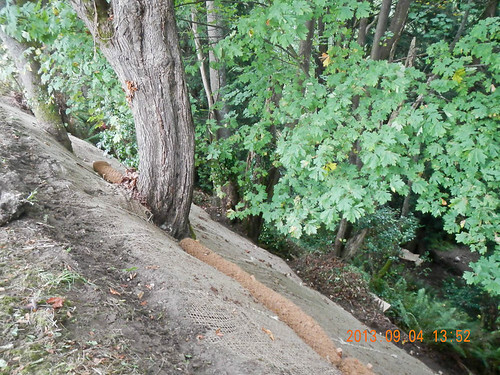 Here’s a side view of the HWB slope erosion control. It’s steeper than it looks from this angle. The wood and branches are laid on the jute to weight it down. Here is a view of the slope before removal, with some workers at the bottom to give a sense of scale. The crew also did some work in another area of the park, even steeper, the North Slope. You can see the stitching a little better in this picture. The coir log is laid across horizontally to absorb any street run off from 90th St/25th Ave.
Here’s a side view of the North Slope work. It looks like this slope is even steeper than the Headwaters Bowl slope. And here is the trash the crew got off the North Slope. 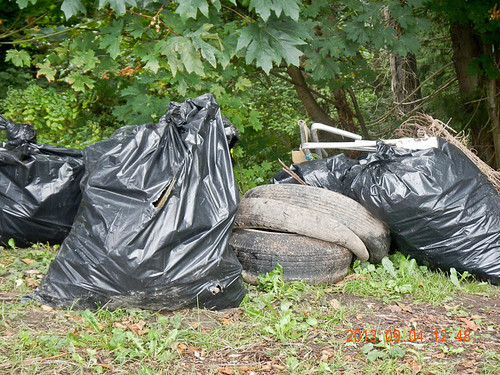 This seems about right, a few bags of cans’n'bottles, some fencing, a couple tires. The full set of ten pictures is on Flickr.